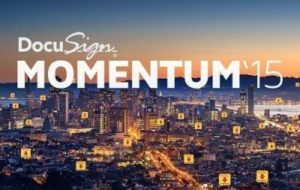 BALTIMORE, MD – eOriginal, Inc., the experts in digital transaction management (DTM) services, today announced its sponsorship of the DocuSign MOMENTUM 2015 conference, March 10 to 12 in San Francisco. As a Premier Silver Sponsor, eOriginal’s presence will include exhibiting as a well as space to conduct meetings and demonstrations. Additionally, Mr. Bisbee will be a featured panelist at MOMENTUM 2015. As a pioneer in DTM and its subset technologies, such as electronic signature, vaulting and transaction services, he is uniquely positioned to provide insights into the technological, business and legal applications of digital transformation. With this expertise, Mr. Bisbee has testified before Congress and presented to the United Nations Commission on International Trade Law, the Federal Reserve Board, state legislators, Fortune 500 companies and other organizations needing to better understand the rapidly growing area of DTM. Partners since 2006, eOriginal and DocuSign offer a powerful joint solution that mitigates risk of human error in contract management, while also reducing costs and increasing efficiency. Once a contract or agreement has been DocuSigned, it is deposited into eOriginal’s eAsset® Management Services environment where it is securely controlled as a secure and legally binding Authoritative Copy throughout the remainder of its lifecycle. Held in the Union Square neighborhood that serves as San Francisco’s social and commerce hub, DocuSign’s annual customer, partner and developer conference brings together digital transformation leaders from the world’s most powerful companies and biggest technology brands to challenge, inspire and share best practices, insights and hands-on approaches for achieving the fully digital business in the Cloud. DocuSign MOMENTUM is designed to help organizations of all sizes, across industries, identify digital strategies to drive productivity and delight end-users with secure paper-free processes. The 2015 event will feature representatives of Deloitte, Gap, LinkedIn, Microsoft, Salesforce, and others to sharing insights on achieving a competitive advantage by adopting a digital solutions.